Sorry. It's the one I got from xkcd at that point in Time. I figured I'd upload it for anyone that couldn't get anything. Don't know why it was a previous frame. 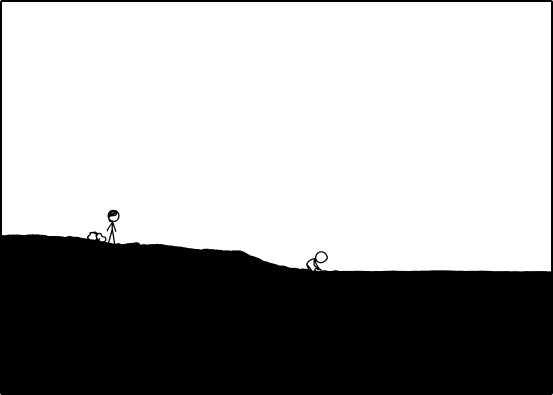 I opened the browser to xkcd just to get the frame. Alternatively, install the newpix converter (link in my sig) and the dates on the OTT will become Just RightTM! IMO, the newpixbot master should not let its post count stay "Internal Server Error". Especially when the OTC is sick. Yikes, I go offline for TWO newpix and the OTT once more fills with Chaos. Breathe, everyone! We don't know what is going to happen, and therefore must Wait for it. (I seem to not be an -ist of any kind, according to descor's flowchart. -Isms, in my opinion, are not good. A person should not believe in an -ism, he should believe in the One True Comic.) And speaking of epic charts, WOW at Sciscitor's quotecircle. I have a respectable quote-hub despite being at 7 o'clock. I think it has. Though it may be worth mentioning elsewhere on the OTW. Hmm...does Cueball have Megan's dilgunnerang in his hand? EDIT: trying to cross, maybe? Last edited by HAL9000 on Sun May 05, 2013 11:08 pm UTC, edited 1 time in total. BlitzGirl wrote: Yikes, I go offline for TWO newpix and the OTT once more fills with Chaos. So that's why the server's were playing up. BlitzGirl, you must never leave us again, so that the flow of newpix shall not be disturbed. Also because we miss you. Pikrass wrote: IMO, the newpixbot master should not let its post count stay "Internal Server Error". Especially when the OTC is sick. Even awesomer ... and it now supports my agnosticism. BlitzGirl wrote: Hmm...does Cueball have Megan's dilgunnerang in his hand? He picked it up, 49 newpix ago. Well, I may know now what happened to the servers: "Time" made the front page of Slashdot, posted at 07:50pm UTC. I didn't get a successful image download (except for copies of frame 1090) for an hour after that. Don't be surprised if we have a small rush of new posters in the thread, with a great many of them (judging from Slashdot comments so far) asking, "What's wrong with you people?" 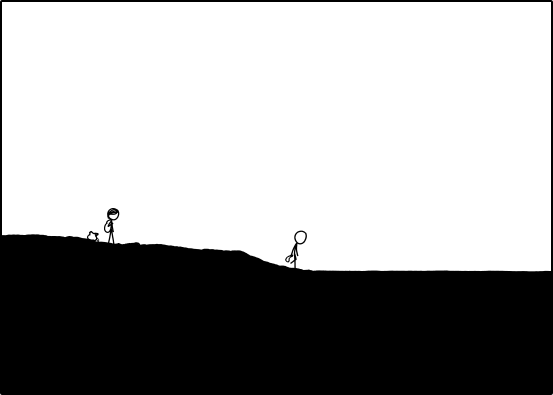 Of course, the funny thing for me is how many people didn't read the Slashdot summary, saw a picture of two people standing on a slope, and said, "Lamest xkcd ever." ETA (way late) direct link to Slashdot story. Last edited by jjjdavidson on Sun May 05, 2013 11:55 pm UTC, edited 1 time in total. BlitzGirl wrote: Yikes, I go offline for TWO newpix and the OTT once more fills with Chaos. Breathe, everyone! We don't know what is going to happen, and therefore must Wait for it. (I seem to not be an -ist of any kind, according to descor's flowchart. -Isms, in my opinion, are not good. A person should not believe in an -ism, he should believe in the One True Comic.) And speaking of epic charts, WOW at Sciscitor's quotecircle. I have a respectable quote-hub despite being at 7 o'clock. I'll admit that Sciscitor's quotecircle does rather put my paltry flowchart into perspective. Not unlike the Total Perspective Vortex. jjjdavidson wrote: Well, I may know now what happened to the servers: "Time" made the front page of Slashdot, posted at 07:50pm UTC. I didn't get a successful image download (except for copies of frame 1090) for an hour after that. That's quite possibly true. 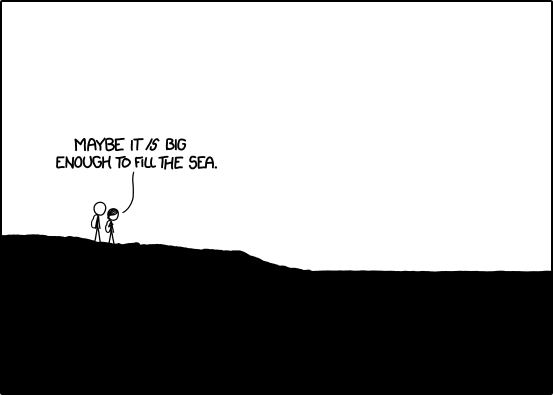 When I was refreshing http://xkcd.com/1190/, it took much longer than it normally does, even when I refresh on the hour. Shoot. Well, I hadn't gotten around to reconsiguring yet, so I suppose that title can just stay where it is. Oh no - Slashdot. Brace yourselves, fellow Knights! The River is small! HAPPY BIRTHDAY TO YOU AND NEWPIXBOT!!!! WOOT WOOT IT'S YOUR BIRTHDAY WOOT WOOT! So is Randall's bandwidth, at least when compared to slashdot's daily traffic, which is very, very big, and does what it wants. azule wrote: HAPPY BIRTHDAY TO YOU AND NEWPIXBOT!!!! Thanks! Have some cake, everybody. Last edited by mscha on Sun May 05, 2013 11:22 pm UTC, edited 1 time in total. BlitzGirl wrote: Oh no - Slashdot. Brace yourselves, fellow Knights! The River is small! Filling the (remaining) bottle, most likely. Water we doing now? Sea puns? Yep, sea pun sand references to sea-related things. I am a bit confused. I posted the text of the slashdot article "Yesterday, 8:42 pm" (Pacific time, so 20 hours ago) And, I was responding to someone else who found it earlier. Slashdot claims the article was posted "Sunday May 05, 2013 @03:50PM". (Not sure what TZ, but only an hour ago if in my TZ) And, the server problems started a couple hours ago. I am having a hard time reconciling these times. I do not assume my post saw a future post on slashdot. And, there seemed to be a long time between the slashdot posting and the server problems. Does this make sense to anyone? Perhaps we yacht to shore those pun-toons up for later. Water we going to do if they flood the OTT again? At least they'll be held in moderation purgatory for some Time. Am I to undersand that these puns are humourous? Haven’t any of you people ever been to the beach? ... friendly jab... Considering how long they have been walking along the beach, it doesn't surprise me at all if they would notice that the beach is getting narrower and narrower; even taking into consideration that the coastline (and thus the depth of the beach) would vary. Not if you have your left hand under your chin1. Which I have a lot when just reading. So it actually saves me a lot of time. Exactly! I am so thrilled to have discovered the middle click via this thread, just now! Tatiana wrote: Ohmygosh I love my hat! Thanks, buffygirl! You're the best! I did read that one, and in my mind whenever anyone else mentioned it I noted that it had already been mentioned. Just so you know you were noticed! Megan was standing too close to the River1bank, off of which Cueball had just fallen. He grabbed to pull her back, but then realized he was maybe invading her space, and so apologized. But she acknowledged that he was right - standing that close to the edge is foolhardy. I thought that much was pretty obvious...amazing the body language the great Randall conveys into stickfigures. I recall that at the time some folks interpreted it as a sudden affectionate move (with no mention of a functional move) that was basically rejected. I had never gotten around to replying, so I was doing it here. vvn wrote: I am a bit confused. I posted the text of the slashdot article "Yesterday, 8:42 pm" (Pacific time, so 20 hours ago) And, I was responding to someone else who found it earlier. Slashdot claims the article was posted "Sunday May 05, 2013 @03:50PM". (Not sure what TZ, but only an hour ago if in my TZ) And, the server problems started a couple hours ago. I am having a hard time reconciling these times. I do not assume my post saw a future post on slashdot. And, there seemed to be a long time between the slashdot posting and the server problems. Does this make sense to anyone? What was previously linked was a proposed story, which was finally voted up and "posted" today, is my guess. Slashdot is in California, IIRC, so Pacific Daylight. descor wrote: Am I to undersand that these puns are humourous? My original post was about a Slashdot submission, which sits in a review queue (their "Firehose") for a while before the editors decide whether to drop it or post it. The time you see now is when an editor finally approved the story and posted it to the front page. I see. That makes sense. I didn't know enough about how slashdot works. Thank you. It's a boat time somebody warned me about that! Last edited by ucim on Tue Sep 22, 2015 1:11 am UTC, edited 2 times in total. mscha wrote: Thanks! Have some cake, everybody. And now it's (past) time for coma. 'night everybody, and don't let the river bugs bite. "fail" perhaps, but a lot less painful than "success". The front-page post was at 12:50 PDT/MST, so 19:50 UTC, and 15:50 (or what you call 3:50 PM) would be EDT. I also happen to have a fairly low Slashdot ID number, though I use it quite rarely these days. Added: I guess this would be a good time for me to update the animated GIF on Explain XKCD, assuming it's not getting hammered too badly. Of course it is closely correlated to the top quoters in the OTT. It contains only top quotes, no quoted quotes. If someone of the professionals on here could point me to a visualization tool for Linux that can digest a graph with about 800 nodes and about 9000 weighted edges I would be very grateful (my usual CLI tool, i.e. graphviz, forsaked me for this, it simply took too long even on an eight core, 16GB box). And no sorry: Gephi looks fine but I would like to avoid installing Suns jre and jdk. Could you clarify the "top quotes" statement. A single quote is obvious. With a nested quote, I would call the "newest comment" the bottom quote because that is where the statement is usually placed. But to clarify myself, you do mean the "newest quote", right? Sure... I only counted original quotes, not quotes nested into quotes. With "top quote" I am refering to the first quote inside the posting, the one that may contain other quotes. So... now I've played around a bit with my new dataset and thus created a very simplified graph visualization of this thread. Circle size corresponds to posting count, clockwise position to being-quoted-count. The blue lines are quotes - the darker and wider, the more quotes. The dataset is rather massive so I had to prune it to the top posters/quoters/quoted. (I would also like to guide your attention to the fact, that there is no visible line between His Holiness Pope Helper and cmyk.) Enjoy! lol that is awesome, Helper, we are linked by the black line of doom! StratPlayer wrote: Ok. But I'm still claiming a "called it!" if we start panning into an overhead view... Even if it looks like the one BlitzGirl showed. She's good. If only this Tread had an avatar mitten maker of similar calibre. (thank you and) OH NO YOU DI'N'! This is also telling me that I am spending WAAAAY too much time on the OTT. Especially since I have hats to make. HAL9000 wrote: Ooh! Idea! Combine this with one of Kieryn's charts, and put the day that each of the top 100 quoted users first posted in the thread! I don't think I've ever "heard" you "sound" so girly! They can make shoes out of caffeinatedseamencancerbaconbabbiesonice now? ?